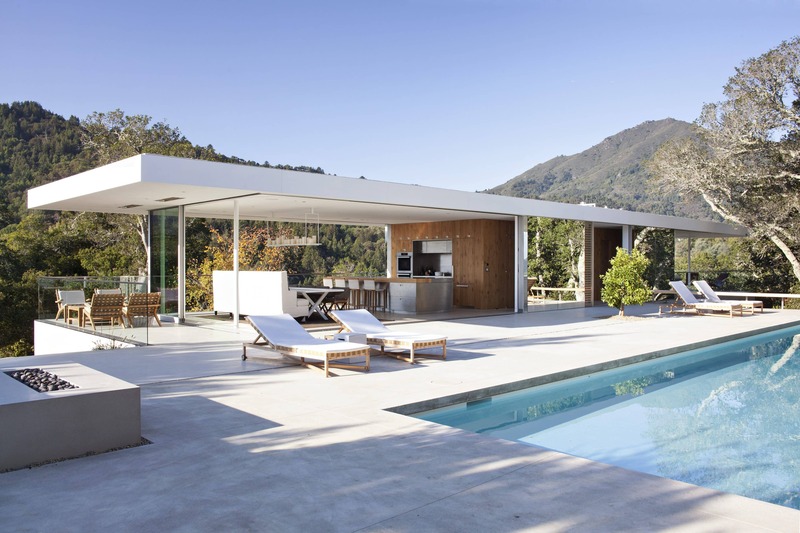 A modern residence that disappears into the landscape. The Turners had cherished their previous home, an extraordinary Victorian, but when a rare ridge-top site came available, they began imagining a completely different way of living. 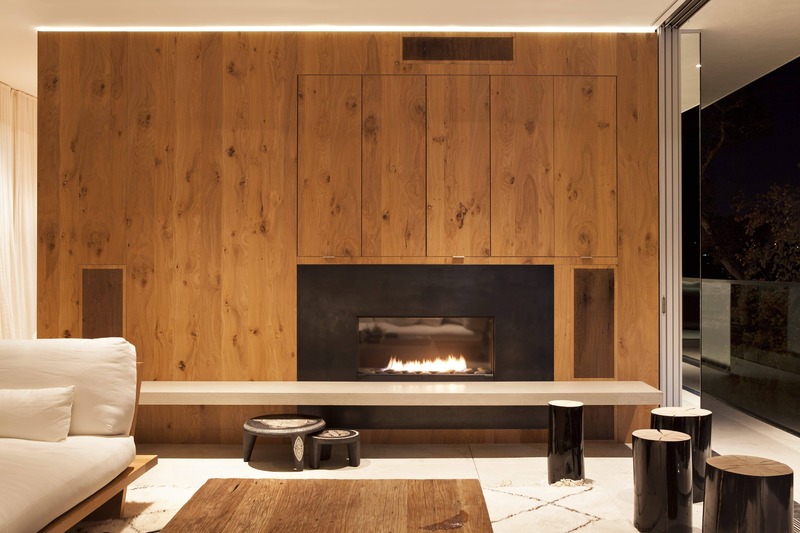 They envisioned a house that is beautifully simple and connected to nature, a design that preserves the tree covered site and is mindful of their neighbors and community. 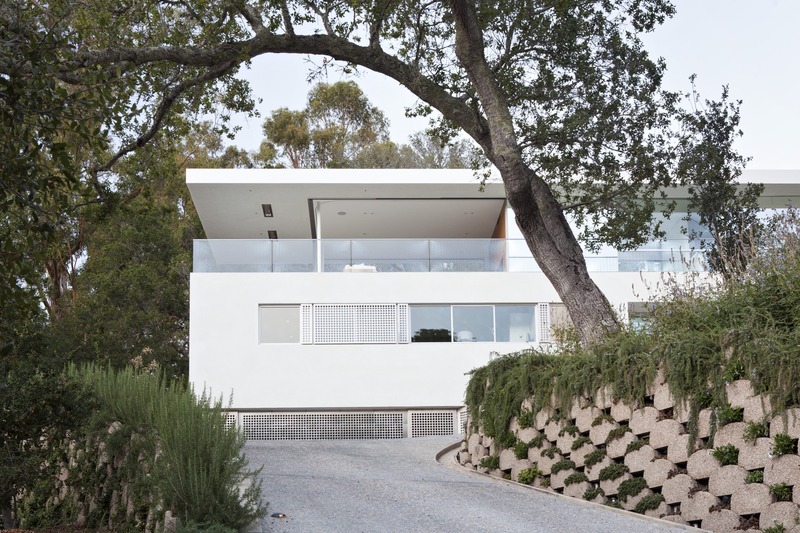 Jensen responded with a house that vanishes into the landscape while creating a remarkable setting for family life nestled amongst the oaks. 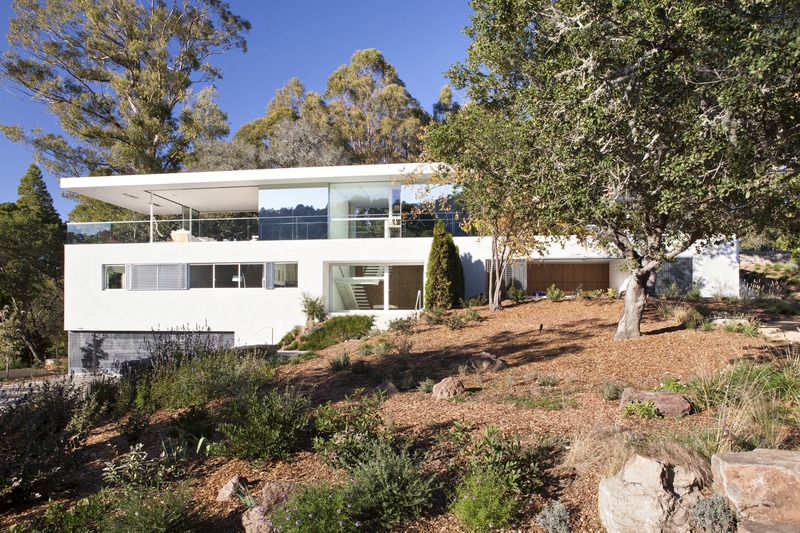 The house is built carefully into the hill, rather than on top of the hill, to avoid diminishing the ridge or harming the site’s many heritage oaks. This strategy also organizes the program: Private spaces are protected within the half buried lower levels, while above, public areas are open to the landscape, a pavilion enclosed only with retractable sliding glass panels. The long, slender roof plane extends from the building’s core, appearing to float above the pavilion. 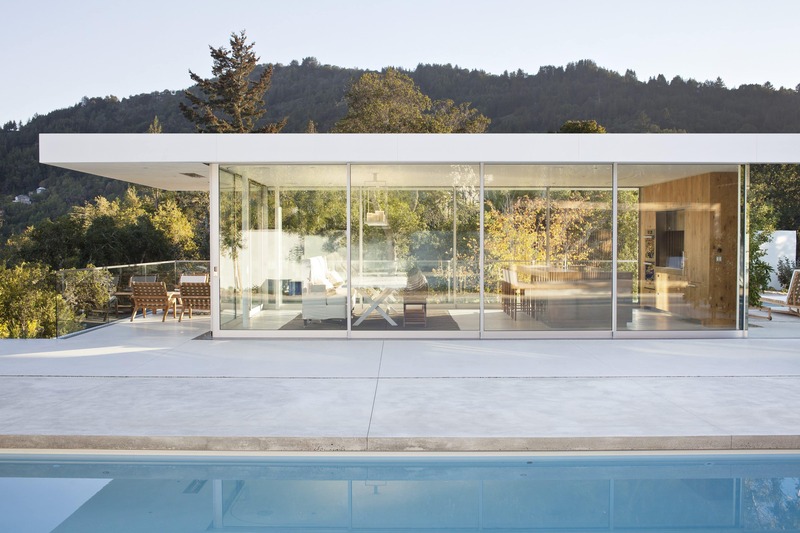 Clad in mirrored panels the core vanishes in reflections of the surrounding trees. When the glass walls are hidden away in the core, the living spaces flow out onto the adjacent terraces, landscapes, and panoramas. 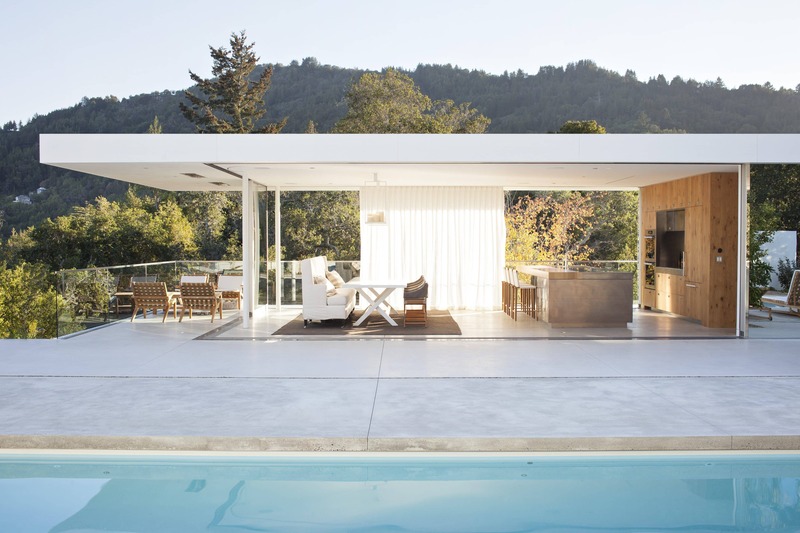 The living room sits high above the ground and surrounding oaks, opening to private yet expansive views of Mt. Tam and the green terrain. 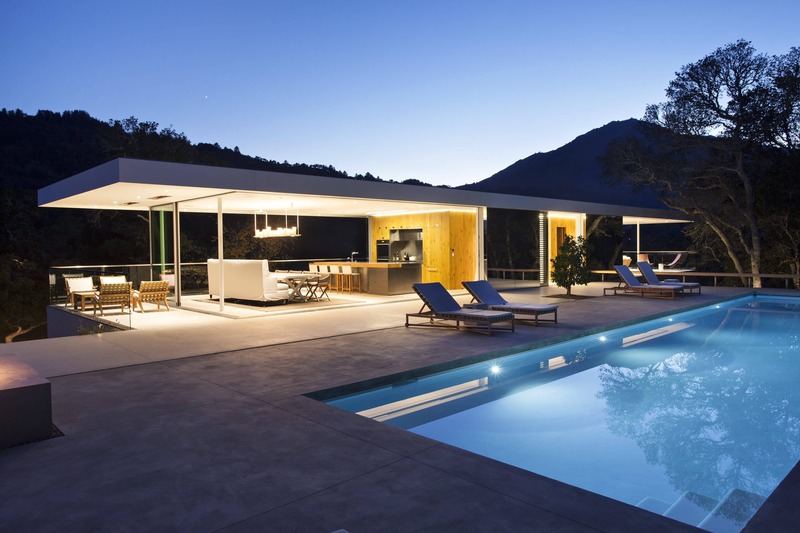 At the northeast side of the house, the dining room, kitchen, pool, and main terrace are effectively fashioned into a seamless indoor/outdoor living area. 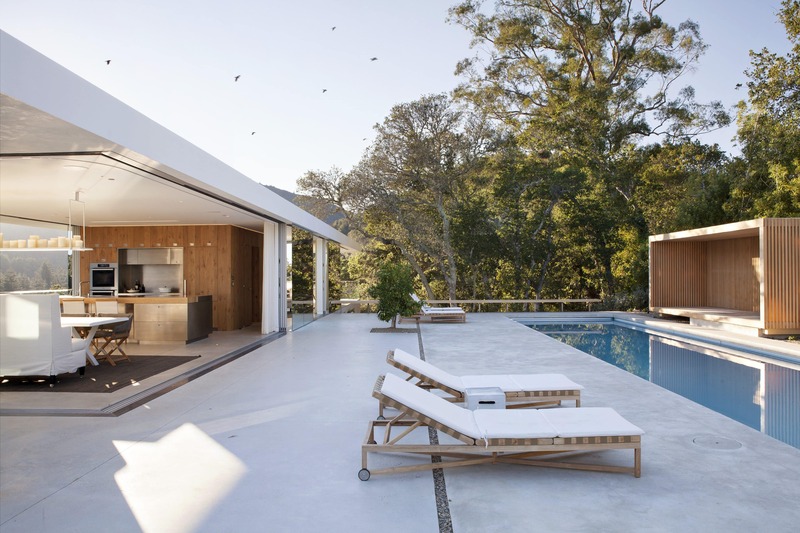 The structure of the house mimics the surrounding oaks with their limbs extending horizontally from solid trunks. The building core, a solid stack containing stairs and bathrooms framed with robust CMU walls, forms the “trunk” while the roof structure composed of steel beams covered by a lightweight steel deck are the limbs. Here, though, discreet slender steel pipes support the outer ends of the roof, which cantilevers almost 40 feet from the core. Architecture and engineering align with elegant effect.